I’m back with this weeks roundup of some of the most talked about and my personal favorite music videos from this past week. So let’s get right to it. Probably the biggest music video to drop this week, as The Weeknd is always one of my most anticipated artists. “False Alarm” as a song is pretty cool, at first I wasn’t much of a fan, but it’s old school punk, pop rock vibes have grown on me more. He’s always different than what’s out there, and that’s why I like him so much. The video has pretty much nothing to do with the song but damn is it cool. Hollywood level production of a bank robbery gone wrong in POV and it continues the trend of The Weeknd killing himself in his videos. Don’t know why, but there’s definitely a trend. It seems we may be getting another Ab-Soul album very soon. He’s undeniably a very dope lyricist, I just hope we get more of the Long Term Soulo because he started to lose me with Control System. “Huey Knew” is a strong start, full of dope wordplay, and backed by a menacing piano and synth loop. The video has him channeling his inner black panther in a warehouse with racial imagery playing in the background. Like all his work, there’s always a deeper meaning. Well it’s holiday season, so you know what that means, Michael Bublé has come out of hiding. There’s nothing wrong with a little Bublé; it’s always safe, accessible, music for all ages. The video is a huge product placement ad disguised as a slightly amusing 70’s dating game show. Not good, not bad, just meh. Ari Lennox for those that don’t know is an up and coming singer signed to the supremely talented J. Cole’s music label, Dreamville. She’s gearing up for her debut and has released the first visuals. “Backseat” is super soulful, kick back music, and her voice is great. The video isn’t anything special (a date night at the local game hall), but it gets the job done. There seems to be a teaser for her next drop at the end and it’s got me excited to hear her full project. I’ve never heard of 6LACK, but he seems to fall in that new rap-sing lane. “Prblms” sounds like a Tory, Tiller, PND, type of song, but at least it’s a good copy. It’s moody and perfect to vibe out too. 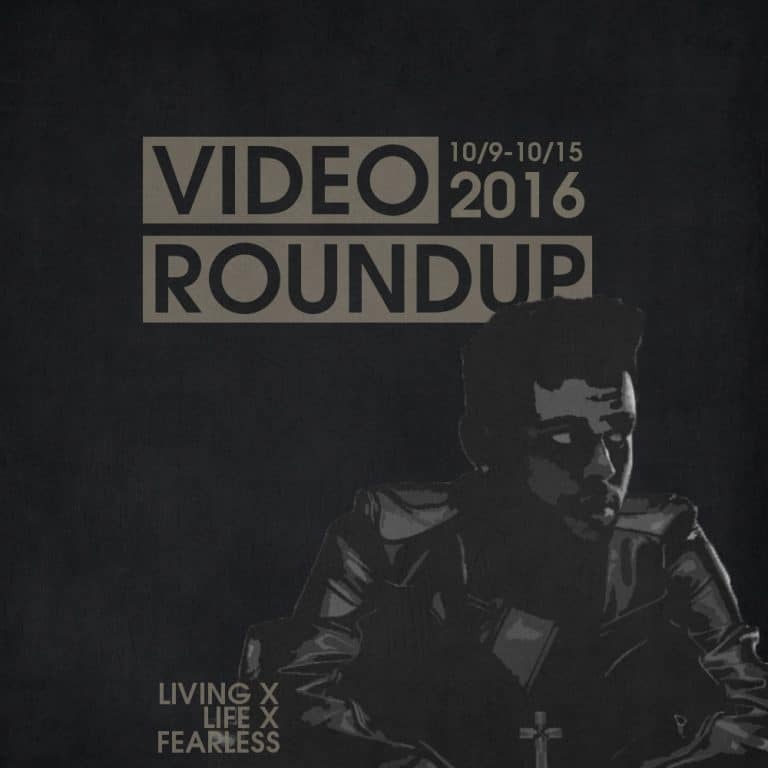 The video is shot in black and white and mostly sees him riding through the streets at night. Nothing that pushes the creative boundaries but it sets the mood appropriately. One of my favorite songs off his last mixtape finally gets the visual treatment. “Ounces Back” has a white guy, with the world’s skinniest dreads, playing 2 Chainz as he does his normal routine. Tour bus, wardrobe, meeting fans, etc. I don’t know why but I’m sure he thought it’d be funny. Back with their first new song in a while and gearing up for a new album, “I Don’t Wanna Know” is what you’d get if you were trying to make a single that captured the essence of every fad/trend out there today. The video even plays off the Pokemon Go fad. Yeah I’m good on this one. I don’t know how or why Kendrick would agree to be on this song. “H.G.T.V” is everything I love about Pusha T (one of my favorite rappers out) rolled into one song; minimalist beat that knocks hard and pure bars and wordplay. He even throws in a shot to Drake? The video is all black and white and has Push rotating on a vertical axis spitting bars and occasionally switching up outfits. It’s super minimalist like most of his solo work, but the rotating effect is super dope, and the contrasts are put to good use. Mirrors the song perfectly. I’ve never been much of an Avenged Sevenfold fan, or much of a heavy metal fan for that matter, but “Buried Alive” was always extremely dope to me. Well add “The Stage” to that list, I just need to grow out some dreads so I can properly headbang. The video is literally a stage with puppets playing out mankind’s violent history while onlookers gawk and cheer on. The twist at the end, is that the onlookers are the real puppets being controlled by the people in power, who in turn are controlled by a larger, more evil puppet master. Eh, too on the nose for me. What’d you think about this week’s music videos? Did I miss some that I should be checking out? What were you favorites? Let me know in the comments below.